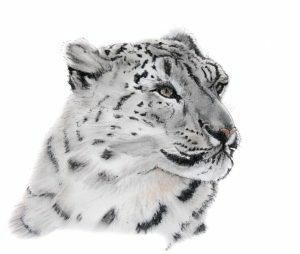 October 2016 found me once again at The Big Cat Sanctuary in Kent to spend the day learning to use pen and tinted charcoal to create a painting of the Snow Leopard. Under Vic Bearcroft’s step by step guidance I was fascinated to see how a few simple strokes and a hint of colour could transform a drawing into a stunning image. I have always loved using charcoal in its willow stick form but had not tried the tinted charcoal pencils until that day. Combining them with a fine pen I was able to create soft illustrations that I can add to my repertoire for painting my beloved wildlife. Like the graphite drawings you need a good quality heavy weight cartridge paper or even the hot pressed watercolour paper would be perfect. 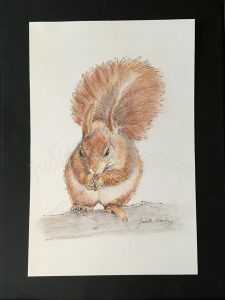 This is the painting of a Red Squirrel I did as a Christmas present for my son James.